Leo moves around on the floor, sometimes on his back and sometimes just supporting his body with one hand or just a finger. As he moves about on one half of the stage in a ‘room’ on the right of the stage his movements are projected into an identical ‘room’ on the left of the stage BUT the projection has turned 90 degrees. 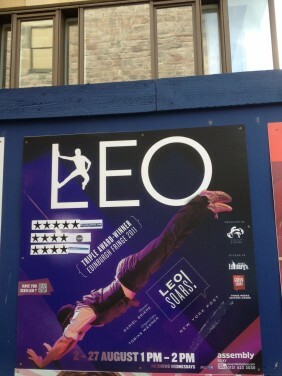 This means that as Leo shuffles on the floor along the stage, he appears standing perfectly normal and upright on the left of the stage, within the projected room. For a riveting hour he acquires furniture, a cat, a parrot, a rug and a fish bowl all drawn in chalk and even has to escape water when the fish bowl in the projection tips over. He finally escapes through a hole in the bottom of a suitcase which on the right is fixed to the wall, but of course in the projected left hand side room his escape is seen as through the floor. Beware of a slight nausea if watching the left hand movements only as your brain tells you what this man is doing isn’t normal!! !